You might be home late from work and dinner is overdue! Who’s going to feed me? He might even be thinking of invading my territory! That paperboy that comes everyday – each day he comes and I have to chase him away. It’s a tough job, but someone’s got to do it! Someone human in the house gets stressed or angry - Who do I need to kill? Mom put a big bone in the kitchen rubbish. I’d better guard it from the other dogs until she takes it out! What’s that big bang? Where can I hide? And if I hide, how do I protect my family from this monster? Who are all of these people coming in and out of the house? Are they safe? Can I trust them? It’s a hard job to protect the house from all of those people and cars that go by all day when Dad’s at work. I’m really exhausted by the end of the day! I could probably go on for pages with all of the things that might stress your pet. I’ve but mentioned a few. It might be interesting if you would add more to the list for me of things that concern your individual animal. So send them to eugenie@ttouch.co.za and let’s see what we come up with. The reason I mention these few are that I often have people say, “What would my dog get stressed about? He has a good home, love, enough food, toys to play with, etc. etc. However, we often don’t realize that they do indeed get anxious and often a Body wrap can be a great tool in helping them cope with these situations. HOW DOES IT WORK? I’m not sure if there is a definitive answer to that question, but think of a swaddling blanket on a baby. Women have known for years that a fractious baby can often be calmed by being wrapped in a blanket. I often think of the African women in this country who carry babies and children on their backs. I don’t know if I’ve ever seen one crying! I’m sure it happens, but not often. The body wrap seems to give a sense of security or being held. I’ll never forget the time I came home from my first TTouch Training. I had been working with a dog trainer on being able to walk Danilo, my cross breed (bull?, pit?) terrier around the neighbourhood without him going for every dog behind every gate! We had had some success, but it was random and never consistent. The next session we did I put Danilo in a Body Wrap and although he perked up at every gate where he knew there was a dog, he didn’t once go for one! He still looked, but seemed to be quite happy to go by without altercation. I was gob smacked! It actually took me awhile for the light bulb to go on: He had on a Wrap! Was it really possible for it to make such a difference? Indeed it was and is! After that I used body wrap on him and after a time I didn’t even need that. I could see when he’d start to stiffen those back legs and I simply did a few leg circles to remind his body how to relax and off we’d go past the dog or gate. Another story involves my Golden, Angelique. She used to get carsick and would throw up 3 times in the 20 minutes that it took us to drive to training. It wasn’t actually motion sickness, but an anxiety caused by too much excitement. I had tried homeopathic remedies to no effect. The first time I put a body wrap on her, she made it all the way without getting sick once! Admittedly I did Ear work as well, but I think the Body Wrap really made a huge difference. Today, she can ride for long distances without the wrap and without getting sick. Lest you think this bandage is some sort of miracle I will again say that I have worked on her confidence since she was a puppy, but many of you met her at WODAC last year and I think you’ll agree she handled herself amazingly well for a previously shy, nervous dog. Having said that, we often see some immediate changes with the body wrap on as in the cases above. Another perfect use for it is for dogs that are fearful of thunderstorms and fireworks. I have clients who keep the body wrap handy in thunder season. Although if you use it regularly, you might find that come that storm, the dog handles it without a wrap! Calming an excited dog at a show, training, etc. And this is true for most animals. 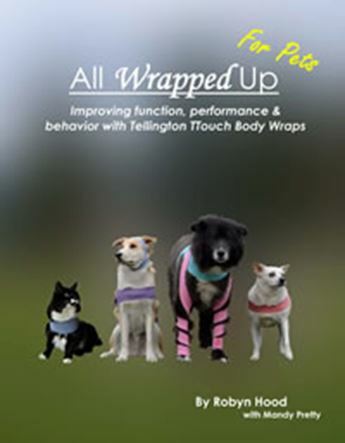 We use Body Wraps mostly on dogs and horses, but also occasionally on cats & other animals as well as on humans. There is a wonderful book written by Temple Granden who is autistic and discovered that ranchers were using a cattle press to keep the anxiety level down in cattle during injections, etc. The reason being that if they were anxious at procedures, the adrenalin levels went up that toughened the meat. She decided to make herself a home made press where, when she felt her anxiety level rising, she could sit down and pull a lever to feel something firm against her body. She found that when she did this her anxiety quickly lessened. HOW TO DO THE BODY WRAP! We had a great response last month from the body wrap article so now of course I’m under pressure to describe “how to” do it! I think the first thing you need to know is there isn’t a right or wrong way. We have many different configurations of wrapping dogs and I will endeavour to give you a few. I feel I also again have to caution you that although the wrap is a wonderful tool to use in many situations, I strongly urge you to remember that it is but one aspect of the TTouch work which includes the Touches as well as Groundwork and that the use of all three is recommended for success! This is a way of giving your dog some sense of its body without needing an elastic bandage and it sometimes easier for certain dogs. Use an appropriate size T-shirt, such as a child’s T-shirt for small dogs, an adult medium or large for mid-size dogs, and extra large for large dogs. Place the T-shirt over the dog’s head backward, with the front of the shirt facing up. Put the dog’s front paws through the armholes. Take the loose material near the hem and gather it into a knot or secure with a scrunchie at the waist on top of the back. The bandages are elastic, very stretchy and beige in colour. They come in 2-, 3-, 4- and 6-inch widths. We get ours from the Medical reps and have them available in the TTouch office. Bandages are held in place with diaper safety pins. When fastening wraps on the back, do not pin directly on the spine. Remember: Safety pins can come open, so please be safe and use a Baby pin! Place the centre of the wrap at the centre of the dog’s upper chest. Bring the ends up on either side to cross over the shoulders, then down behind the front legs, crossing under the belly, and up to the centre of the back. Fasten the ends with a Baby pin. Variation: As the dog adjusts, pull the pinned portion back to the lower spine. Later pull it back around the hips at the top of the tail. 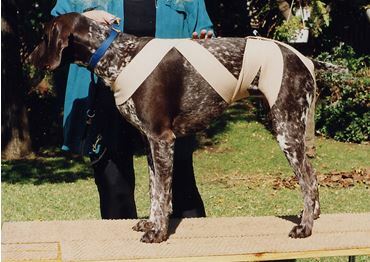 These adjustments provide some of the benefits of a Full-Body Wrap and help the dog accept that configuration. Usefulness: For dogs who are shy, concerned about their Hindquarters, or wild and you just want to get something on them! We generally refer to a full body wrap as connecting the front chest of the body to the rear end or buttock area. There are many ways to do this. Below are some ideas. If you want to try your own configuration I usually advise that in the beginning, one of the ideas is to help put the dog into balance, so keeping it more or less symmetrical is a good idea. #1 Full Wrap in Two Stages: Leaving the Half-Body Wrap in place, fold a second bandage in half to find its centre. Slip one end under the pinned part of the Half-Body Wrap and pull it through until its centre is under the pin. Fold it over so it is two layers thick and moving from the waist straight back toward the tail. Remove the pin and use it to secure all four layers at this intersection, or use a second pin to do this, avoiding the top of the spine. Separate the two ends and pull them under the abdomen on either side in front of the hind legs (without crossing), back between the legs, then up on either side of the tail. Secure the ends onto the bandage on the lower back with another Baby pin. #2 Simple Full Body Front of Thigh: Take the centre of the wrap, place on the chest just under the front of the dogs neck, pull the ends up over & across the back, then between the 2 legs from the front of the leg (without crossing – means pup can still do his business!) – and up by the side of the tail and return along the back. Pin to the bandage where it crosses the back. Note: If you have slippage near the buttocks, you might want to secure the 2 pieces of elastic a second time closer to the tail. Be careful not to be on top of the tail, particularly if it’s a dog that already has confidence problems. Variation: You might want to rather go down the back and over the buttocks first, then down next to the tail, under the leg from back to front and finally up the side of the body and pin on top to the 2 pieces of bandage going already down the body. #3 Double Diamond Wrap: Use a single length of elastic or two bandages pinned/sewn together. 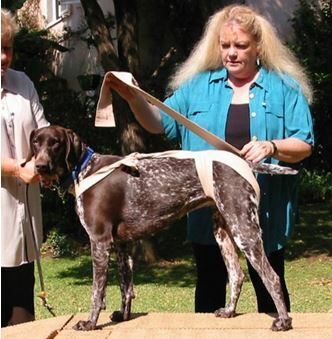 (Depends on the size of your dog) Place the centre of the wrap over the centre of the dog’s chest. Pull the ends back and up to cross over the shoulders, down to cross under the belly, up to cross over the small of the back, then through the inner thighs from front to back and up on either side of the tail to the cross at the small of the back. Secure the ends at this intersection with a Baby pin. Variation: (either #1 or #2): Instead of pulling the ends up on either side of the tail, wrap the left end around the left hind leg and pin it in place at the top of the thigh; wrap the right leg the same way. This variation engages the hind legs. The wrap should be snug but not tight enough to interfere with walking. 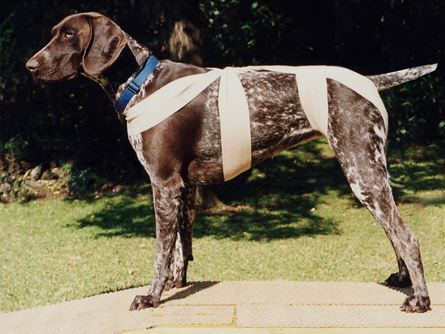 #4 Racing Stripes or Debby Wrap: (named for one of the Instructors) Use a single length of elastic or two bandages pinned together. 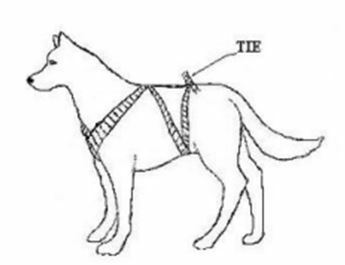 Holding one short end, tie a loose overhand knot around the dog’s neck Or pin the pieces together. Pull the rest of the bandage straight down the spine to the base of the tail. At the right side of the tail, bring the bandage down inside the right rear leg and toward the front of the leg, then up and across the small of the back to the left side. This creates a flank-to-flank cross-piece. Thread the wrap through the inner thigh of the left hind leg, front to back, and up the rear on the left side of the tail. Tuck the wrap under the flank-to-flank cross-piece and bring it up to the neck[ if you have enough wrap] and pin where the wrap connect just behind the neck already. Pin at this point. Figure 2: Take the long piece down the back and over the hindquarter. Figure 3: From the rear, bring under the leg towards the front, then take over the back of the dog to the “other” side. Figure 4: From the "other" side, go under the leg from the front and up over the "other" side of the hindquarters and bring up over the spine. Slip the bandage “under” the cross piece on the hips just to stabilize it. Figure 6: Shanti in the full “Debby” wrap which has only been pinned once at the shoulders. If you find your wrap slipping near the hips, pin again all three pieces just over the hip area. GENERAL: The configuration of your wrap often depends on the shape of your dog. For instance a Double diamond wrap might be hard to keep on a sloped back of a German Shepard. If one doesn’t work, then try another! Or make up your own. Be creative! You might want to start with 20-30 minutes, but you could certainly do longer. Do a short time each day and start to notice what effect it has. 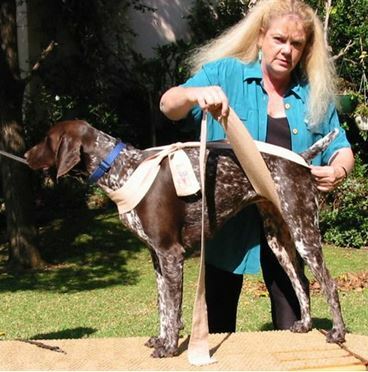 Try to Use the wrap when the dog is active and walking as one of the uses is to bring awareness into the body. If a problem, then work with what the dog can handle. Be careful NEVER TO LEAVE YOUR DOG UNATTENDED when using the wrap. Like any equipment, it could catch on something and cause an accident. If the beige colour is a bit bland for you, dye it a cheerful colour for more fun! If you can’t find or afford to buy an elastic bandage, use whatever you might have around. We don’t really recommend crepe bandages as they tend to crumple and not hold their flatness & shape over the body, but it “might” be enough to help. Try it and see. But if you don’t have results, please don’t say that the wrap doesn’t work! 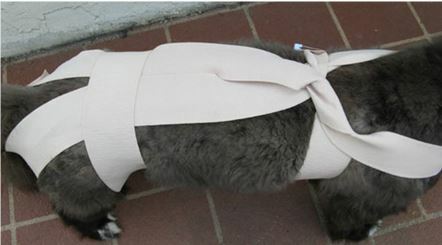 If your dog has sore hips or knees, a full wrap might be too much. Do start with a Half Wrap before venturing further. Also use a half wrap first on a fearful or very nervous dog. If your dog freezes when the wrap if first put on, coax forward with food, chat or play. Most dogs soon learn that they can actually walk freely! Be sure to be respectful of their concerns. Many people have the tendency to laugh when they first see their dogs in a wrap. It can look “rather” strange! So have fun and laugh “with them”, not “at them”. After all, the whole idea is to boost their confidence. It’s a great way to meet and chat to people. Everyone will want to know what “happened” to your dog. See if you can explain what you’re doing. The effect of the wrap is cumulative. I have many clients who have used wraps on their dogs daily and by the time the thunder storms comes around, they don’t really need it! – Please don’t however, think that this is the norm, All Dogs are Different! If you want to buy a wrap, please email us at info@ttouch.co.za and tell us what breed of dog you have. Anything other than a very small breed will take one and a half to 2 Bandages. It depends on which wrap you use. We will send you a list of prices and payment details. 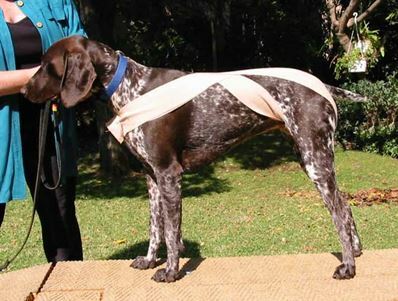 Cost of bandages runs between R50-R80 per bandage depending upon the width. 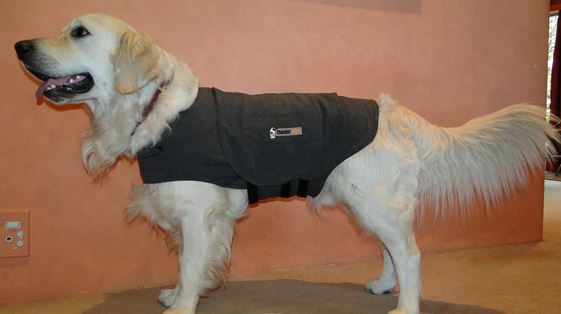 Here is Harley modelling the Thunder Shirt.